Rachel B. Griffis grew up in Michigan and then moved to Southern California, where she completed her B.A. at Azusa Pacific University and M.A. at Chapman University, both in English. She completed her Ph.D. in English at Baylor University. In 2016, she joined the Language and Literature department at Sterling College, where she teaches writing and literature courses. She has been very active on campus and in the lives of her students. In May 2017, she led the Sterling College mission trip to Nepal, and during the 2017-2018 school-year, she accompanied students on two trips to Washington, D.C., where they attended events hosted by the National Student Leadership Forum. 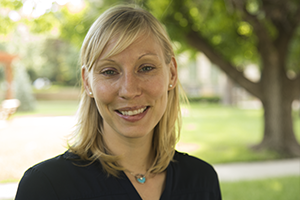 Additionally, Dr. Griffis serves as Director for the Integration of Faith and Learning, a position that allows her to work with faculty and to implement new initiatives related to the moral and academic culture of Sterling College. When she is not teaching or studying, she enjoys reading, running, and traveling. Dr. Griffis has published articles in Religions, International Journal of Christianity and Education, Women’s Studies, Teaching American Literature, and elsewhere. She regularly presents her work at academic conferences. Her research interests include American literature, women writers, religion and literature, and faith and learning.